For this piece, art director Reseca Peskin asked me to recreate one of those stereotypical romance novel covers where the voluptuous woman swoons against the shirtless man in some romantic location. 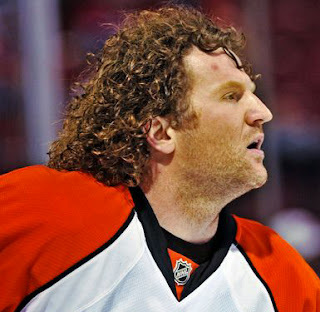 Considering that the cover story is about fan fiction being written about Philadelphia Flyers players, the man being swooned for in this case is Philadelphia Flyers left wing Scott Hartnell. I had a lot of fun finding various examples and references of the romance novels and discovering just how many of them have the exact same composition (seriously) For my initial sketches, I worked up some variations of the standard pose and placed the couple in a moonlit garden. Once the first sketch was picked, I moved on to inking the final. I just switched to a new brand of ink and was extremely happy with how black my linework was on the paper. The previous ink I had been using was always turning out grey and not as opaque as I wanted. 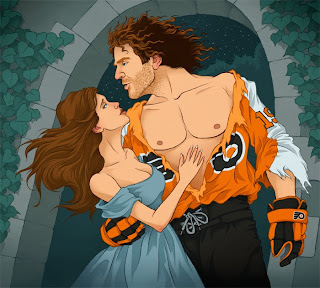 In coloring the piece, I tried to make the orange of Hartnell's hair and Flyers jersey really stand out against the blues in the rest of the scene. I'm really pleased with how the piece turned out and loved the text that Reseca and the folks at the City Paper did on the cover - it really nailed the romance novel look! Thanks to Reseca and the City Paper for the sweet job!